What an amazing home. 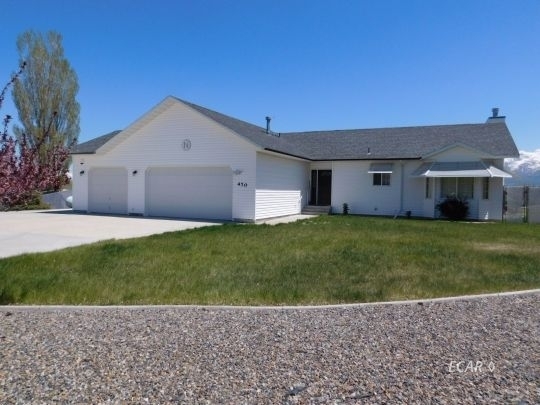 Sits on the corner with spectacular views of the Ruby Mountains. Huge living room with fire place (propane insert), and lots of windows. 2 master bedrooms, one on main level with his and her closets and one in the walk out basement. Master bath has jetted tub and separate shower stall. So much room. 2 more bedrooms on main level. Laundry is also on the main level. Walk down stairs to the walk out basement which features a huge family room, another room that is being used as a craft/office/?? room. Walk out to a covered patio (covered by the enormous deck) that is about 370 Sq. Ft. where you can sit and enjoy the sunrise or just enjoy the views. Privacy fencing around the whole back yard which is completely landscaped with sprinklers. This home has so many extras.